Just a line or two before going up for our night in the dug-out. It is Godsal’s birthday today & there is to be a “blow-out” tonight which I shall unfortunately miss. However that cannot be helped & doubtless I shall be all the better for not eating too many unwholesome delicacies. Yesterday morning was very long & very tiring. I had to sit on two Courts-martial & both of them lasted well over two hours & a half. There were seven or eight people all cooped up in a small room on a beautiful morning, when we might have been much better employed somewhere in the open air. Today is again a simply lovely day & if only it will keep on being so for the next month we shall be all right. This morning we had a “grand stand” view of what looked like being quite an exciting air-battle. A German machine came foolishly round quite close to one of our observation “sausage” balloons. Just as he was going away one of our machines came on him from above & went for him hot & strong with his maxim. The Bosch got away all right in the end but was evidently hit as part of his machine was on fire. We have had several good rides lately, & the weather & general “springiness” about in the air is very reminiscent of this time last year. Wollaston & I used often to go for rides together when we were close to the only hill in Flanders, & took whatever opportunities we could seize to get off the dead level mud-flats. I must run now as the barber is waiting to cut my hair; it has grown very long during the last few days. He is really I believe a bomb-thrower but will no doubt manage it all right. The weather is still very changeable & there are strong intervals in the spring sunshine with which we are favoured for several hours each day. Yesterday was the Brigadier’s turn for the trenches so that meant I had to go as well. As I believe I said each of the red-hats has to spend one night in three in the advance Hqrs. The third officer, as on board a ship, shares the watch with the skipper, so I went with Col Jones, who is at present acting skipper; the real one is at home on leave. We had rather an amusing time at night trying to mark out a new trench behind our present position. The ground has been very much fought over, & one cannot walk three yards anywhere without coming to a water-logged shell hole. It was pitch dark & trying to rain so you can imagine our difficulties. The wind was blowing hard & the marking tape blew out in great curves which made it appallingly hard to keep a line. We did it all of course by compass & only avoided breaking our necks by waiting for the Hun flares to shew us where not to walk. Only once did I come down a real smash & then Toller came down full on top of me. The whole thing was very amusing & a Machine Gun which occasionally came across our way added a little excitement to it all. After all this excitement & amusement the rest of the night was fairly quite except for the mice which persisted in running all over the place. Our Hq. hut has a good many large chinks in it & numerous draughts found their way into our bed-sitting room. Otherwise it was a most delightful night & I slept very well. I have now got a horse. You must not ask how I have managed to get it, suffice it to know that it is here – a dark, almost black & rather sprightly lady. She wants looking after for a time but will, I think, soon be a very useful mount. We took her out this afternoon, & tried a few of the hurdle jumps that Viccars has erected at the back of our mansion. She went over pretty well though I nearly come off myself once or twice. I shall probably have to buy a saddle & bridle, & all the other necessaries for it when I do eventually get my leave but that will not cost a tremendous amount & it is just as well to have one’s own kit. I hear the latest Bosch effort is to get bits of steel sharpened at both ends & painted a straw-colour, distributed amongst the oats for our army horses. This seems to be a pretty poor way of carrying on the war, & it really is time that such things came to an end. The damage so done can only be immaterial but the whole idea is so paltry. Some newspaper correspondents are coming to pay us a visit so you may see some more nonsense about us in the halfpenny papers in a day or two. Col. Jones is the man they always want to see because he goes on talking gaily for an hour or two about nothing in particular, & seems to give one an awful lot of information, while really he never says anything to which the censor could possibly take objection. Work, work, work and nothing but work, accompanied usually by rain. Continuous, complete and destructive. When it is not rain it is snow. The latter is of course far worse from the point of view of trenches because it melts very suddenly & the volumes of water thus caused simply smashes down everything. When an unthinking enemy also helps the water with a daily three hour bombardment with the largest trench mortars at his disposal, & turns our front line system into a series of craters and morasses, life becomes anything but pleasant. Through it all the men keep wonderfully cheerful, and really it is wonderful because the conditions are worse than we have ever had them before. Last night I spent with the General in advance Bde Hq. the coldest night we have had for some time. The evening was fine & I had rather a pleasant stroll visiting several of my old friends in ours. Everyone is very upset about poor old Farmer, & I hope the Huns have to some extent regretted it. One of his greatest friends is Adjutant of the Howitzer Brigade & every available shell has been hurled into their lines. The Brigadier is going on leave very shortly & Col Jones will come here to command the Brigade in his absence. Jones is a great man for Port & we have run out so I don’t know what will happen. Our supply is taking a very long time coming out from home. It was rather amusing going round the trenches with the General this morning. Every single thing we came across seemed to be wrong & several people, mostly officers, got very severely “strafed”. However when we came to the place which had been more or less demolished by the mortars things altered a bit. It was so utterly laid waste that one could not possibly tell what was meant to be trench, so we hopped about from one hole to another, up to our waists in filth, & I, at all events, expecting every minute to see another great sausage come hurtling over at us. Fortunately none came, & the General was so thankful when it was all over that he forgot to strafe anybody else, & was very affable to all he met. The Bde Major is up there tonight & a real beast of a night it is too, snowing hard. The General has just given me a little more to do so must stop with love to you all. Last night I forsook the comfort of my downy couch and slept once more in a dug-out. This was not as you might imagine from any desire for the realities of trench warfare, but because it is now necessary for one member at least of the Bde Hqs to live at night in the advanced “battle” headquarters. Last night it was the Generals turn to go up there & I went in attendance. It was a little cold but I slept quite well, except of course for an occasional mouse or two. One little brute ran straight across my face; I very nearly screamed. My regiment had a stroke of very bad luck indeed yesterday; poor old Farmer who has never missed an hour since the day we came out was killed by a trench mortar. Death fortunately was instantaneous. He is an officer about whom you have probably not heard very much, and yet I think undoubtedly he was the best officer the regiment has ever had. He was absolutely fearless, & never lost his head in any circumstances. Loved by his men every one of whom he knew intimately, he was also one of the most cheerful members of the mess. I knew him very well & can never remember having seen him either angry or despondent. He can never be replaced. 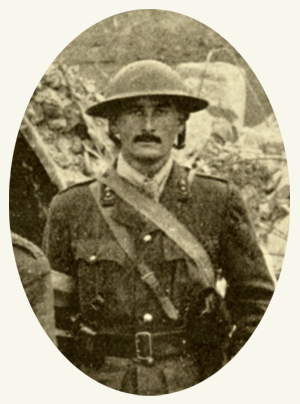 Going along one of the trenches today I suddenly came across a very familiar looking countenance, to which I immediately attached the name Walcott. It was in fact a son of L Walcott & he has just rejoined the Brigade – having been at home sick for some time. I am sorry you are so unfortunate with your pets, they all seem to come to an untimely end. We here have a cat, or rather five cats & certainly not less than 200 kittens – they are becoming rather a nuisance. In spite of my somewhat futile ancle I managed to toddle up to the trenches yesterday & had quite a good day on the whole. Viccars & I went together & both of us came home absolutely as tired as we could be. Fortunately recent presents from home include two chickens & a plum pudding, so we had a real slap up dinner waiting for us when we got home. Tomorrow I shall probably make another excursion & possibly spend the night somewhere in the neighbourhood in a dug-out. We are rather far away here & the double journey is apt to become very tiresome. V. & I had one rather amusing incident. There was an aeroplane overhead being shelled & a rather large piece of shell came buzzing down. We heard it coming some half minute before it actually fell & we both hurried to get our heads under cover – leaving of course our back ends sticking out. Fortunately it missed us both by a few feet but poor old V. was a trifle scared I think. His place is hardly in trenches & he is not quite used to these sudden alarums & excursions. Today has been a busy one at this end, maps & grenades, trench stores & returns. The quantity of paper that a poor wretched Brigade office gets shot at it from all higher authorities is something too appalling for words. Work has been going on at such tremendous pressure during the last few days that I have absolutely lost count of everything. I have not the remotest idea when I last wrote but imagine it must have been some time ago. And yet in spite of all this work nothing of any real interest or importance has happened. Today has been simply glorious, bright sunlight & warm, a real spring day. This morning Church parade to which I walked via one or two woods, & across the fields, a most delightful & quite unwarlike proceeding. The parson could not preach for toffee & chose inappropriate hymns. One compelled us to say that every evening we pitched our tents a day’s march nearer home. This seemed very well for those about to go on leave but for the rest of us not quite so realistic. This afternoon we rode over to see a most extraordinary & interesting demonstration. Some thirty odd men were put in a trench & told to sit well down in the bottom thereof. Then another gentleman wearing a tube helmet approached to within nine yards of them with a captured German “flammenwerfer” with which he proceeded to attack them. There was a tremendous jet of fire with bright red flame, & thick black smoke, giving out tremendous heat, & making a noise like several hundred express trains. He tried hard to spray the trench but the liquid became vapour as soon as it caught fire & would not in consequence travel downwards. The result was that in spite of a thirty yard jet of roaring “liquid fire” thrown at them from thirty feet away, no one in the trench felt anything more than a little warm. It quite proved to all of us what a ludicrously futile thing the great flame-projector really is. I have been indulging in a strained ancle for the last few days, & so have not visited the trenches again. There has been plenty to do however back here with maps & other such things of that sort. The ancle is nothing very much & does not prevent my riding. The country round here is very good & the weather ideal so I usually manage to get an hour or two with a horse sometime or other during the day. The weather still continues more or less spring-like though there has been an occasional shower or two during the last two days. I spent yesterday wallowing in mud, rolling along disused trenches that had so far collapsed as to render it dangerous to do anything but crawl along. Crawling in several feet of very think mud is as difficult as it is unpleasant. However I enjoyed myself & had several good peeps at the Bosch. Today I have been employing the other half of myself, namely the half that sits behind & sends along stores of all descriptions to the trenches. This always means anything rather than sitting still & today I have been out quite a lot, flying from one place to another & stealing whatever I could get that I thought would be of any use. I ran into an O.M.T. today – he did not recognize me but I knew him at once, we were in the same Math. Set, a fellow named Brookes. As a matter of fact our relations were somewhat strained as he was a good deal senior to me at school & now only boasts of one star. Tomorrow I hope will be a trench day but I am by no means certain that I shall be able to get away. The weather is very nice for riding & a very favourite game is to leave me to look after the office while the others go careering all over the place a cheval. So far we have had a comparatively peaceful time in our new area; we are exceptionally comfortably housed & so long as our Hun friends don’t see fit to send over any heavy souvenirs we shall be alright. Once more we are really at work again, & it is work with a vengeance. As I believe I have said before grenades & stores of all kinds are now added to my various other little cares, & they do not give me much time for amusing myself. Yesterday was quite an enjoyable time. To start with spring seems to have come at last & yesterday she put in her first appearance. It was hot & bright & quite hard to believe that there really was a war on. I had previously decided on a day in trenches so arose fairly early & sallied forth. There was a simply splendid view & I could just discern in the distance the Church tower of one of our old familiar friends – a town at which we used to congregate. The trenches were of course still very wet, & in some places I paddled along very nearly waist deep in horrible thick mud. The men of course are not at all in that state of liquidity, I was trying to find my way along some long disused communication trenches, to spots remote & isolated, said, in fact, by the people from whom we took over, to be unapproachable except at night. They are by no means really so to one who does not mind getting a little dirty about the boots. Today has again been glorious as far as the weather is concerned, & we are hoping again for the same tomorrow, when I am again on a trench visit. This morning I worried around trying to arrange for stores & grenades for the battalion in the line. We have a good chance of using plenty of grenades in this part; the Bosch & ourselves are almost within hand shaking distance all the way along. There is a good deal of indiscriminate anarchism every day, in which we take great care to give back at least six for every one we receive. Of course we hope for the best, but if our efforts have not been more successful than those of Brer Bosch, he has not had many hurt so far. We in fact have not lost anyone to the Bosch bombers – (here I touch wood.) This afternoon I rode over, a matter of four miles or so, to see the distribution of stores & other such likes, & get them started on their way trenchwards. I rode another of the signalling officers horses, not the little black animal that stumbled me over her head on a previous memorable occasion. This beast was rather nice to ride but had a most powerful mouth, & almost pulled my arms out in my endeavours to stop it’s wild cross country career. I shall most certainly ride it again when I get the chance. I came across one rather amusing thing during my little tour yesterday. I was calling on an officer in a rather bad part of the line & found him at the bottom of a sort of tunnel which he was using as a sort of dug-out. He looked very miserable & had his fur coat doing duty for a pair of trousers – one leg in each sleeve. The reason for this somewhat curious rig – rather of the Wild West type – was as follows. – He was out at night by himself just having a look round when he suddenly ran into five Germans who chased him. He ran for his life & for some time was completely lost, constantly having a nightmare-like time. At last he saw some sort of a trench ahead and jumped, or rather plunged in, for it turned out to be shoulder deep in water. When I saw him his underwear was still being dried. The “Germans” were subsequently found to be some men of another Coy who had chased him thinking he was a Bosch!! The relief is complete & I am back once more in the comfort of headquarters. It has been a pleasant though a very dirty three days & in some ways I have enjoyed myself immensely. Later on when our doings do not have to be shrouded in mystery I will tell you all about it. Also I will tell you about a most delightful gentleman whose acquaintance I have made, whose company I enjoyed for nearly forty-eight hours, whose dug-out I shared & whom, such is the way of the war, I shall in all probability never see again. Here we are very comfortably situated, not a bad house on the whole, well furnished & with no occupants except a caretaker. We face South & I have been lucky enough to secure a bedroom looking over the front garden & entrance. All we need now is to have a little spring-sunshine to melt what we hope is now the last fall of winter snow. The nicest room in the house is the one that we are using as a sitting-room; it contains a comfortable arm-chair, a modestly satisfactory fire-place & a piano. The trenches are at present pretty beastly on account of the snow but there are some really first-rate dug-outs & the whole thing might be made quite high-class as soon as the weather becomes a little more clement. I managed to do a good deal of scrambling about the old bits of ditch that represent what used to be called a trench, & had several good peeps at the Bosches who seem to be suffering in the same way as ourselves from a collapsed parapet. While up in the trenches the other day, or rather on the way up, I came across an R.A.M.C. Doctor who wanted guiding up, so I volunteered to take him in tow. He was rather aged & had to request me to go slower, so I offered to carry his haversack. “Oh no”, he said “It is quite light – I have only a clothes brush & a tumbler”. And it is a fact that he, a soldier, carried a tumbler about, a glass tumbler wherever he went because he objected to the feel of a tin mug. Think of it, his only necessaires a clothes brush & a tumbler!!! Yesterday was a horribly busy one & I had no time for writing even a hurried scrawl. In the morning we had a few lorries working for us, & in one of these I made a tour into a neighbouring village to get most of what we wanted, but was absolutely unable to get any drinks. What the General will say & do if we run out of whiskey I cannot imagine – I shudder to think of it. In the afternoon I went over in an Ambulance to look at some of the billets into which two of our “peoples” are moving today. The ride there was fairly pleasant but coming back was a nightmare. It was dark before we had finished our inspection & also had started to snow. Someone had to guide the way so I went on the box & tried to do it. Fifteen miles through a blizzard on the front of a car without a windscreen was bad enough but worse still it was absolutely impossible either to see maps or read snow-covered sign-posts. We finally rolled in very late for dinner at 8.30 pm. It was a great pity because Col Heathcote was our guest & we had arranged what Godsall calls a very recherché little dinner. Everything went swimmingly once we had got under weigh. After dinner I tried my hand at concocting a rum punch, for which “ours” is getting famous out here. It was jolly good but almighty strong & I don’t know yet whether the worthy Colonel found his way home all right after two glasses of it. I probably put in a little too much brandy in it – however for a first attempt it was good. Today I am going to disappear in the direction of the trenches & shall stay there for three or four days during the relief so don’t expect to hear for a day or two. It really doesn’t matter where we are so don’t worry, think of “sugar”. By the way – don’t say in your letters “I suppose you are at or near ——-t” Censors open letters both ways & might think I had been telling things I shouldn’t.